Set Last Name Only, saying. IF you purchase the toss garter and send me your name I will send you the toss garter you purchased with You're Next embroidered on it. PLEASE READ SIZING INSTRUCTIONS ! -Using a soft tape measure, measure around your thigh where you'll wear the garter ( usually about 4 - 6" above the knee) Note: DO NOT pull the tape in too tight your measurement will be smaller than it actually is. DO NOT leave it too loose either, or your measurement is going to be to large. Wrap the tape so that it perfectly flush to your skin without any intense pulling or drooping. It is best to measure in a standing position. I will subtract the proper amount to ensure a good fit based on the stretch of the lace. 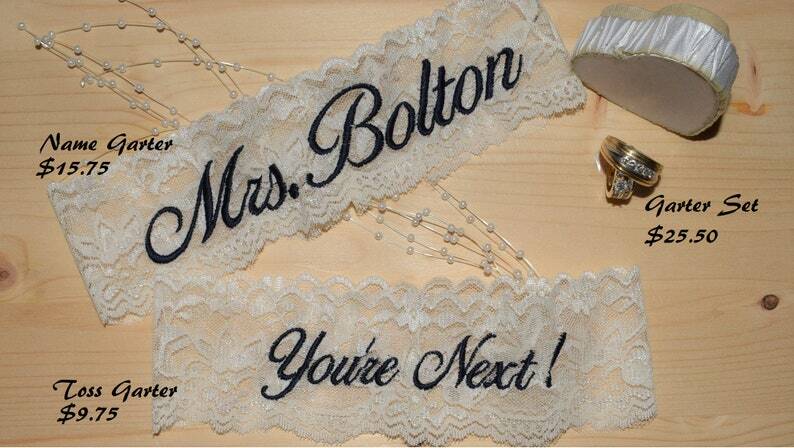 Beautiful bridal garters are made with 2 1/4 inch White or Ivory soft stretch lace and personalize. This garter set does not include the date. Not a vinyl iron - on, or a heat transfer of any kind. Your name will not crack or peel off. YOU must include this information when purchasing in notes to seller. 2. Thread Color for Name garter. 2. Thread Color for Toss garter. 4. Thread Color for Toss garter. 5. Names & Date for Thumb Print Tree, and saying you would like under the tree. Garters ONLY does not include any props used in the picture. -Using a soft tape measure, measure around your thigh where you'll wear the garter ( usually about 4 - 6" above the knee) DO NOT pull the measuring tape tight, as this will give you an incorrect measurement. I will subtract the proper amount to ensure a good fit based on the stretch of the lace. * If you don't have a measuring tape, wrap a string around your leg and measure it with a ruler. * Please type your soon-to-be last name as you would like it to appear in the "notes to seller" section at checkout. Please double check the spelling and capitalization of your new last name, as I will not issue refunds or exchanges due to typos. * Due to monitor variance colors on your monitor may appear different from the actual product. We do not issue refunds due to color differences. * All garters are sewn to order by myself, using an industrial serger sewing machine giving your garter a clean strong seam. * Due to the personalization all sales are final. No refunds or exchanges. If there is a problem with your order please contact me. * I am not responsible for lost or stolen packages, once packages are in the possession of USPS all claims need to be filed with USPS. * By submitting an order and payment you have read and understand all the terms listed in the item description. Please feel free to message me with any custom requests or questions. If there is a color you want that you don't see, just ask. Thong White Personalized . You pick your thread color. Be sure to check out my personalized Wedding Garter Sets. Father of the Bride Handkerchief Mother of the bride Handkerchief gift Customize your hankie with your own words. Looks great and SUPER quick shipping. It got here so fast and the color is perfect! I highly recommend this shop!! I placed my order and to my surprise it was in my mailbox 2 days later! The garter is adorable and fits just like it should. This is a perfect fit for a bride on a budget! Love it! Love it! Love it! It fit just right and is going to be the perfect “something blue”!! The coloring may be slightly different due to monitor effects, but I strive to put up the most accurate representation of the coloring as possible. Opening Your Envelope or package. I am not responsible for any damage during the process of opening your envelope or package. I have over 200 colors of embroidery thread.